It was a big weekend for US teenagers, but before I get to all that news, I want to make sure you are aware of the article renowned tennis journalist Joel Drucker wrote for the Tennis Recruiting Network. Joel and I have conversations about the topics he addresses in this article when I run into him at the slams, and I'm glad I was successful in getting him to provide his thoughts to a wider audience. Anyone interested in tennis as a game for life needs to consider Joel's thoughts on what's missing in many junior development structures today. The only tennis played today at the Eddie Herr were the second and final rounds of qualifying for the ITF Grade 1. Four US boys and six US girls are among the qualifiers for the 64-player draws. Sridhar, seeded No. 7, had to play only two and a half sets to advance to the main draw in the second and final rounds of qualifying, with his opponent in the second round, Petros Tsitsipas of Greece, retiring down 4-1 in the first set. Tsitsipas, younger brother of ITF No. 2 Stefanos Tsitsipas, took a nasty fall in the second game of the match and was nursing his elbow when he got up. He took a medical timeout, then continued playing for two more games, but he was not effective, and so chose to retire. 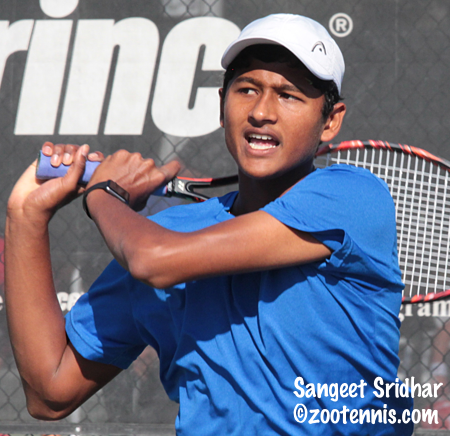 Sridhar, 16, had a tough match in his final round of qualifying against No. 9 seed Simen Bratholm of Norway, but came through with a 7-6(4), 6-4 victory. Unlike many of the juniors playing the Eddie Herr ITF, Sridhar has not played on the ITF clay circuit the previous weeks, coming straight to Bradenton's IMG Academy from his home in Arizona. "It's nice to play qualifying; I got some extra matches under my belt before I go into the main," Sridhar said. "It's good practice, if you make it through, and now the goal is to start winning matches in the main draw. I trained a couple of weeks and it's my first tournament for a while." Fifteen-year-old William Grant is one of two unseeded qualifying players to make it to the main draw. Grant defeated No. 3 seed Carlos Sanchez Jover of Spain 6-1, 6-2 and No. 13 seed Sebastian Mermersky of Bulgaria 6-2, 7-6(2). He will have to beat Mermersky again in the main draw on Monday, after Mermersky received entry as a lucky loser. Timothy Sah is the other unseeded American to advance. The Stanford recruit lost only 12 games in his three victories, and on Sunday he defeated Yuchen Wu of China 6-4, 6-0 and No. 8 seed Boris Kozlov 6-1, 6-3. There are 23 US boys in the draw, with Sam Riffice(7), Trent Bryde(11), Gianni Ross(14) and Oliver Crawford(15) seeded. World No. 1 Miomir Kecmanovic is the No. 1 seed. The only unseeded qualifier to advance to the main draw is 17-year-old Jada Robinson, who beat Melissa Plambeck and No. 5 seed Malkia Menguene to advance to the main draw. In three USA vs Canada matches, the USA won two, with No. 3 seed Amanda Meyer beating No. 14 seed Raphaelle Lacasse 7-6(1), 7-5 and No. 7 seed Salma Ewing defeating No. 11 seed Alexandra Tutecky 6-3, 5-7, 6-2. The Canadian winner was No. 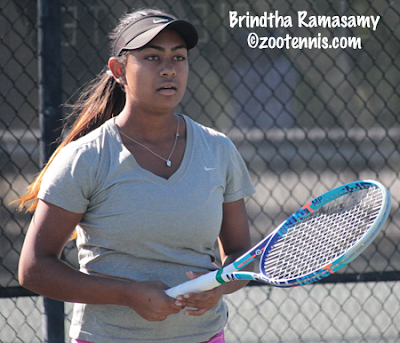 10 seed Brindtha Ramasamy, who defeated No. 2 seed Abigail Desiatnikov 6-2, 7-6(7) as the light began to fade. Knowing a third set would not be completed Sunday, as there are no lights on the Har-Tru courts, Ramasamy had extra motivation to get the win in straight sets. "I just wanted to finish," said the 15-year-old from Toronto, who couldn't convert on her first two match points at 6-4 in the tiebreaker. "I went for it, just went with my gut instead of being too safe, and I guess it worked." Ramasamy's first round opponent on Tuesday will be Sofia Sewing. There were two late withdrawals, with Elli Mandlik and Maria Osorio Serrano of Colombia giving their spots in the main draw to lucky losers Peyton Stearns and Lacasse. There are 28 US girls in the draw, with Ellie Douglas(3), Natasha Subhash(7) and Morgan Coppoc(14) seeded. Xiyu Wang of China is the top seed. Although the first round of the Eddie Herr ITF is split over two days, all the other age divisions will play their first rounds on Monday. Full draws are at the TennisLink site. Top seed Amanda Anisimova won the ITF Grade 1 Yucatan Cup last night in Merida, defeating No. 2 seed Jodie Burrage of Great Britain 6-1, 6-2 in the final. No. 7 seed Gabriel Decamps of Brazil won the boys title, defeating No. 2 seed Yshai Oliel of Israel 6-3, 4-6, 6-3 in the final. Burrage is the only Yucatan singles finalist competing in the Eddie Herr this week. The boys doubles title went to Oliel and Andrew Fenty, the No. 6 seeds. They defeated unseeded William Woodall and Brian Cernoch 6-4, 2-6, 10-8 in the final. Oliel and Fenty also won the doubles championship last week at the Grade A in Mexico City. Unseeded Sada Nahimana of Burundi and Maileen Nuudi of Estonia won the Yucatan girls doubles title with a 4-6, 6-3, 11-9 decision over No. 2 seeds Maria Portillo Ramirez of Mexico and Sofia Sewing. 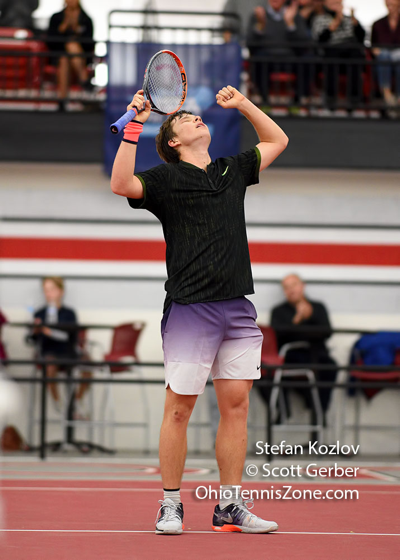 Eighteen-year-old Stefan Kozlov closed out the 2016 ATP Challenger season in style, claiming the the $75,000 Columbus Challenger title with a 6-1, 2-6, 6-2 decision over No. 6 seed Tennys Sandgren. Kozlov, the No. 4 seed, had lost in his previous three appearances in an ATP Challenger final. He will move inside the ATP Top 120 with the title. The ATP website has more on the amazing 2016 run by American teenagers in Challengers (which includes three titles in the last four weeks). Former University of Memphis standouts Joe Salisbury of Great Britain and David O'Hare of Ireland, seeded fourth, won the doubles title in Columbus, beating Great Britain's Luke Bambridge and Cameron Norrie, the latter a junior at TCU, 6-3, 6-4 in the final. The year's last event on the WTA's 2016 calendar came to close this evening in Hawaii, where 17-year-old CiCi Bellis, seeded fourth, captured the Hawaii Open title with a 6-4, 6-2 victory over top seed Shuai Zhang of China. The title at the WTA 125 level tournament is Bellis's third straight, coming after two consecutive $50K titles in Canada. The 27-year-old Zhang, a wild card into the tournament, is currently 23 in the WTA rankings. With the title, Bellis will move to around 75 in the WTA rankings. For more on Bellis's title see the WTA website.